December 28, 2015 – Mister Journalism: "Reading, Sharing, Discussing, Learning"
For the rest of this blog post, follow this source: Do You Really Think The NRA Supports The 2nd Amendment To Keep Us Free? Think Again. The Health Insurance Marketplace open enrollment period for 2016 health coverage is November 1, 2015 through January 31, 2016. If you are enrolled in a marketplace health insurance plan, your coverage ends December 31, 2015. To continue health coverage in 2016, you can renew or choose a new plan during the marketplace open enrollment period. Education levels the playing field, creates opportunity for all, and builds better communities in our country. However, the equal opportunity for education is being denied to Michigan’s black, Hispanic and special education students via a man made disaster. Governor Rick Snyder is violating Brown vs. Board. A separate and unequal school system, an educational apartheid has been created in Michigan. This apartheid has the greatest impact on special education and minority students. Black school districts are under the authority of the Governor, and his appointees. White districts are under the authority State Board of Education and their local elected Governance. Under Governor Snyder’s management, educational test scores, and property values dropped in the districts he managed, in direct relationship to his policies. In addition, under Governor Snyder, individuals who complain have been retaliated against or discredited. Before Emergency Management, Detroit, enjoyed the highest test scores of any district in the nation for poor students.Now, the Governor’s EAA has the worst test scores in the nation. This suppression of diverse opinions was also seen in the Flint Water Scandal, another man-made disaster where Governor Snyder’s spokespersons discredited Dr. Mona Hannah-Attisha and Virginia Tech before the truth was finally revealed by leaked documents. 1. Through mismanagement and retaliation, Governor Snyder is further creating educational refugees by making the public schools so unacceptable, and the morale, benefits of teachers so low, that it is driving staff and students away into charters intentionally. 2. This financial disaster is artificial. DPS was solvent until state intervention. —- To maintain control of Federal and local education dollars to have them to give corporate welfare to billionaires, and create more charters, he divides DPS in half by creating the EAA and proposing the DEC, the Detroit Education Commission. Meanwhile, here are some of the expenses under State control. – $60 million to a out of town corporation to “evaluate teachers”. — During this time, teachers took pay cuts. 3. 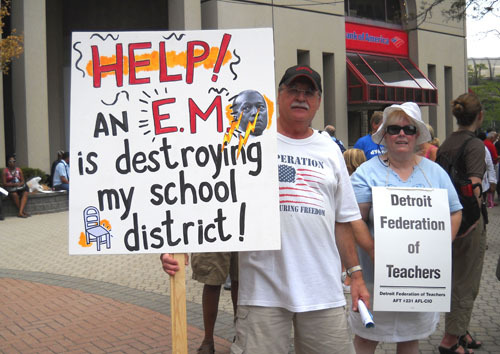 Those who want a DEC, like the Skillman Foundation, Dan Varner, (Excellent Schools Detroit) and the Governor, simply want the power to have control over the lucrative contracts surrounding billions in Federal funds. It sounds nice to say, “we want excellent schools”, but these words are merely subjective “fluff talk” which mean absolutely zilch policy wise and only covertly satisfies citizens, while bamboozling voters and tax payers, yet is ultimately accountable to no one. So let us be honest. In truth, the State Board ALREADY has the power to close failing charter schools in every district state wide. Unfortunately, the Governor has stripped and continues to strip the State Board of some control in minority districts. Democracy dies. Emails and other documents revealed in the discovery process of a suit against the State show that Skillman Foundation and other Coalition members were given directions in 2009 to push students out of DPS, into charters, and work together to achieve a DEC-like appointed Board after voters rejected state control in 2005. In this way, non-taxpayers could be in control of the money. Yet, we clearly see that giving appointed persons control over billions of dollars and public infrastructure compromised public safety and opened the door to corruption. Strips Neighborhood Voice Taxation without Representation. Did you know every traditional public tax payer funded school that closes causes a $1000 drop in property value for every house in Detroit? Did you know every traditional public tax payer funded school that closed in your neighborhood caused a $20,000 drop in property value for homes in the neighborhood? Did you know that two schools closing in a neighborhood caused a $70,000 drop in property value for homes in the neighborhood? That said, when we are specific, then who should have a say in school closures: those who are directly elected to make that decision over their tax dollars by the residents, or appointed persons? Other districts have charters and public schools, but no other district has a DEC. This is a clear sign of being treated unequally and this violates the guidelines of equal opportunity for all to enjoy a public education as well as violating the Voting Rights Act. Yet, many, unfortunately, are ready to compromise the democracy many gave their lives for. Those who wish to destroy public education have participated in violating the civil rights of disabled children, educational staff, citizens, parents, and most of all vulnerable students. —b. Impact – Children raped on their way to school in the EDUCATION DESERT created by Snyder. —d. Caused property values to plummet. —e. Financially devastated the district. – PUT MONEY IN CLASSROOMS – Give money to teachers & kids! – STRAIGHT TALK – No more fluff talk and covert and unethical power grabs over public institutions.